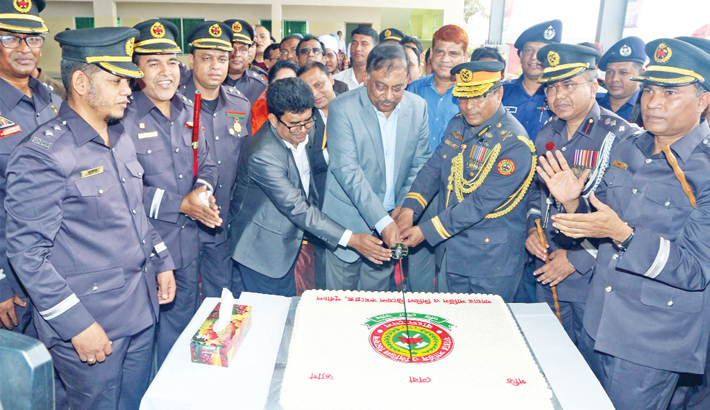 Home Minister Asaduzzaman Khan Kamal on Tuesday said the government is working to increase the ability of Fire Service and Civil Defense (FSCD). The minister said this while speaking the final parade of newly-appointed FSCD officers at Purbachal in Narayanganj as the chief guest. ‘The FSCD is a service-providing institution. You should keep in mind that ensuring safety of people’s lives and properties is your duty,’ the minister said. “Although you have finished trainings prior to joining the job but your real trainings will begin after the joining,” he added. Praising the activities of the FSCD, the minister directed the new officials to maintain the chain of command and to work for the welfare of the institution. Citing the Suhrawardy Hospital and Old Dhaka fire incidents, he said that the fire fighters worked to douse the fire risking their lives. Md Shahiduzzaman, secretary of Security Services Division of Ministry of Home Affairs, Brig Gen Ali Ahmed Khan, director general of Fire Service and Civil Defence, were present, among others.